Driving from Przedbórz down the road no 42 for Radomsko, in the place Granice you ought to turn left to Chełmo. There drive down the main road as far as the palace is visible on the left side of the road. 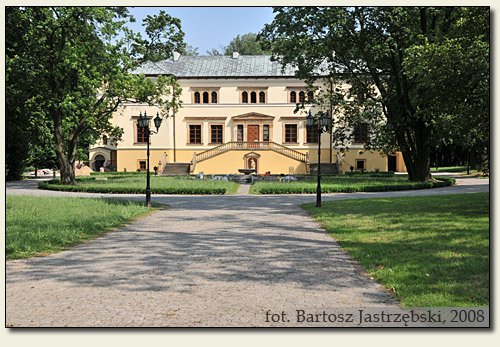 Primarily in Chełmo existed a defensive manor erected in the XVIth or at the turn of the XVI and XVIIth cent. by the Leżeński family. The reconstructions from the XVIIIth and the XIXth cent. gave it the nature of the palace, which it has remained up to this day. Now it is a private property.